Healthcare reform is in full swing and First Lady Michelle Obama has made tackling childhood obesity her No. 1 mission, so the time is ripe for RDs to step up and take leadership roles in raising a healthy generation of children. With this in mind, I asked several health insurance companies and foundations how they are addressing the obesity epidemic, what funding opportunities are available, and how RDs can get involved. Aetna is one of the most active health insurance companies, providing coverage to more than 18 million people in the United States. In March, Aetna refocused its grant-making agenda, naming obesity its No. 1 priority for 2010. Quoting the 2005 report in The New England Journal of Medicine predicting that the current generation of children will be the first in America to have a shorter life span than their parents’ generation largely due to obesity-related disease, Aetna’s grants will support projects that address domestic food policies and their impact on individual food choices, the impact of the “built environment,” why communities with high rates of food insecurity experience high rates of obesity, children’s use of recreational time, and the impact of school lunch and food policies on children. The foundation will award grants of up to $150,000 per year as well as smaller grants to support fund-raising events such as galas and walks, outreach activities (eg, health fairs), and other community-based initiatives. For the last several years, the Aetna Foundation has awarded regional grants of up to $50,000 each to support a wide variety of innovative grassroots efforts by nonprofit organizations to increase health awareness in communities Aetna serves. A sampling of nutrition-related projects include Atlanta’s Center for Puppetry Arts for the creation of “Little Noodle,” a puppet show to promote healthful eating and exercise habits to families; Triple Play, a schoolwide initiative throughout Houston that engages students, teachers, and parents in nutrition and health education; the Lifestyle Education and Activity Program for the Madison Square Boys and Girls Club; the Healthy Kids Fun Run in Washington, D.C.; and Salsa, Sabor Y Salud, a program that helps Latino families in Chicago create healthful lifestyles. Aetna is interested in funding programs in communities where employees live and work and looks to nonprofit organizations with a track record of success. Results are critical and projects won’t be refunded without satisfactory impact reports, whether it’s improved body mass indexes or increased participation rates. Local community involvement is key, as is an understanding of the opportunities and responsibilities of partnership. “The new healthcare reform act has revitalized our obsession with improving quality and decreasing cost, making prevention that much more essential,” says Sam Ho, MD, CEO of UnitedHealthcare. As one of the largest health insurers in the country, Minneapolis-based UnitedHealthcare has launched Helping People Live Healthier Lives, a grant-making collaboration with Youth Service America, with the goal of encouraging young people to create and implement local, hands-on programs to address childhood obesity. Ho enthusiastically describes Health Heroes, a program that awards small grants from $500 to $1,000 to community-based, service-learning initiatives that help kids get and stay healthy. UnitedHealthcare has awarded more than 265 of these grants to schools and youth-focused organizations in 35 states that have developed programs to fight childhood obesity in their communities. From creating school walking clubs to turning vacant lots into fitness tracks to kids designing junk food exhibits for display throughout their high school to growing a salad garden in the school backyard, these programs reward innovative youth leaders to empower their peers to improve eating and exercise habits. UnitedHealthcare is interested in funding programs that provide creative solutions to fight obesity in local neighborhoods and communities, ones that can be easily implemented, scaled, and measured. Ho encourages dietitians to get involved in their local communities. Join the local school board and help create programs at the YMCA, in churches, and in school districts, especially those in underserved neighborhoods since they are the areas in greatest need. 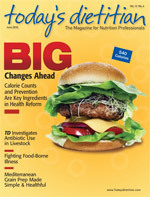 On the insurance side, dietitians should reach out to local physicians and market their services, advises Ho. Let physicians know how RDs’ expertise can help patients improve their eating and exercise habits. Start creating and building support for healthcare teams. Increasingly, these teams will be what works for improving the nation’s health habits. A smaller regional healthcare system, Intermountain Healthcare owns 18 hospitals and health centers throughout Utah and southern Idaho. With childhood obesity statistics mounting, all departments—medical, marketing, and public outreach—sought to design a program that would deeply impact their communities. After surveying their market, they discovered a need for addressing obesity prevention among young teens. Intermountain’s response was LiVe! a social marketing campaign empowering adolescents to be health advocates for themselves, their families, their schools, and their communities. The program features youth-focused TV, radio, and print announcements; in-school nutrition theater assemblies; standards-based activity kits to extend the lessons in school and at home; a weight-management program for overweight children and their families; and a Web site with nutrition and health resources. The program is financed in part by insurance partner SelectHealth. RDs were a part of every step. Clinical nutrition manager Pauline Williams, RD, was brought in to review all of the campaign’s media spots, scripts, and resources and was responsible for developing and carrying out the pediatric weight-management program. According to Williams, the LiVe! campaign has been effective due to its highly integrated approach delivered through many channels—mass media, Web, school, community, and healthcare—all working together to maximize the reach and impact. Williams has learned a lot in her role, successfully expanding her pediatric weight-management program through buy-in from doctors, hospitals, and insurance companies, as well as securing additional funding. She discovered that the Dannon yogurt company offers health grants to communities where Dannon plants reside and was able to secure $30,000 of funding, used to increase the number of lower-income families that could participate in the program. Williams’ advice for writing successful grants: Look at the resources in your area and engage your hospital’s financial department to help craft your budget and the marketing department to provide graphic support. Make sure you understand the scope of your proposal and provide as much evidence in the form of scientific research from credible sources, citing them as you would in a college research paper. The American Dietetic Association Evidence Analysis Library is an ideal resource for this, Williams adds. Continuously market your program, meet with physicians, and supply offices with your brochures. Let grantors know why you are the expert and how your project is the perfect fit for their goals. Clearly, these companies feel the need to promote healthy eating and exercise habits to children now in order to reduce healthcare costs later. Each agreed that no single program will solve childhood obesity, but working together—building healthy environments, passing health-promoting policies and legislation, working with community partners, providing evidence-based programs with sustainable solutions, and starting out early with children, incorporating fun, interactive approaches—will have the greatest impact. Look for allies—people and organizations who have similar goals and objectives—research throughout your community, and find partners with whom you can work to maximize resources. As we’re all aware, it’s going to take a healthy village to raise healthy children, and RDs can certainly take a more active role in creating that village. — Barbara Storper, MS, RD, is founder and executive director of FoodPlay Productions, a national touring nutrition theater and media organization. She is also a conference speaker, columnist, and media spokesperson specializing in childhood obesity prevention.